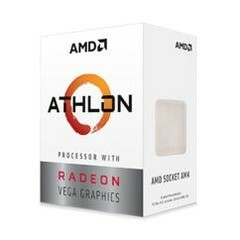 AMD has launched two more entries to its Athlon range: the 220GE and the 240GE. Both processors come with Radeon Vega 3 graphics and offer base clocks of 3.4 GHz (220GE) and 3.5 GHz (240GE), respectively. The 220GE has been priced at US$65 and the 240GE has a price of US$75. The California-based company already announced the 200GE CPU back in September. Computer users looking for a budget-level CPU now have two new choices thanks to AMD. The chip-makers have launched the 220GE and 240GE processors to join the already released 200GE. The two new processors offer slightly quicker base clocks when compared to the 200GE: The 200GE has a base clock of 3.2 GHz, while the 220GE has a base clock of 3.4 GHz and the 240GE offers 3.5 GHz. The new 200GE series of chips can handle not too demanding games at generally lower settings. For instance, Fortnite was tested with the 200GE variant and 49 FPS was measured on low settings (720p). DOTA 2 also recorded a more than playable result with 65 FPS on low settings (720p). The 220GE and 240GE are not unlocked for overclocking, even though there has been an instance of the 200GE variant being overclocked. Considering the low prices of the AMD processors, gamers on a tight budget now have some enticing new options to consider.